Less than a week before our holiday and we're on Hurricane Watch. 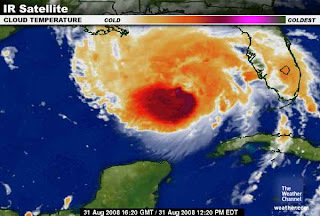 Hurricane Gustav is barrelling across the Gulf of Mexico as we speak, heading straight for New Orleans. I hope it doesn't hit the city, or it weakens significantly before it gets there. Not that we will be anywhere near New Orleans on Monday when it's expected to hit, but I think the people of Louisiana and the other Gulf states have had enough to deal with. Hurricane Hanna is east of the Bahamas, heading for Florida. This one is the one we are currently a little concerned about - it doesn't look like it will impact the Gulf Coast region where we're headed, but will probably skip up the east coast of the States - giving us a bumpy ride as we fly in, and if we're very unlucky, could strand us in Atlanta where we change planes. Just to keep us on our toes, there' s a tropical depression forming out in the Azores which looks a bit dodgy and which, if it becomes a tropical storm / hurricane, will be called Ike. That'll teach us to go to Florida in the Hurricane Season.